Connor and I went out to New Thompson Harbor to see if anything interesting had blown in during the winds of recent days. Weather: It was windy for much of the day, with winds blowing out of the southeast. It seemed fairly light through noon, but there was a dark band of clouds moving in from the west. By the time Connor and I were headed home, the dark band had reached down and brought with it some rain. I thought it was probably around 3pm becuase it had gotten relatively dark, but when I got home I found out it was not even 2:30pm; the decreasing light was due to the much thicker clouds. This time of year, with the sun so low, the thickness of clouds makes a much larger difference in the amount of light we get on the ground. Birds: We did not see anything unusual. There were a couple of loons on the outside of the short section of Crescent Harbor’s Breakwater. We saw several more loons when we were at New Thompson Harbor. 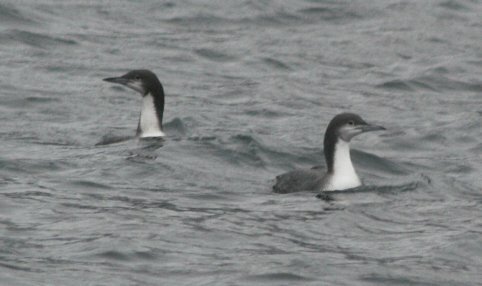 At least three of the loons (including the two pictured above) were Pacific Loons. I think I may need to spend some more time down at the harbor in better light to get some good photos of loons. There was a sizable flock of scaups in a little cove near Sitka Sound Seafoods. I have seen scaups there previously as well.